Mangaluru, Jan 18, 2016: Doctors should concentrate on Rural services along with Quality treatment said N. Vinay Hegde, the Chancellor of Nitte University. He was delivering the presidential address in live Video conference on ‘Creative cardiology’ between Nitte University’s K.S.Hegde Medical Academy and Methodist DeBakey Heart & Vascular Center, Houston, United States, held at Nitte campus Deralakatta. More than 70 percent of people living in Rural India. Giving quality health services should be the motto of young doctors. We are giving free treatment to more than 3 lakh people, every year through our kshema hospital. Every day more than 1500 people getting treatment in our hospital, he explained. The vice chancellor of Yanepoya University, Prof. Dr. M.Vijaya Kumar launched the program. 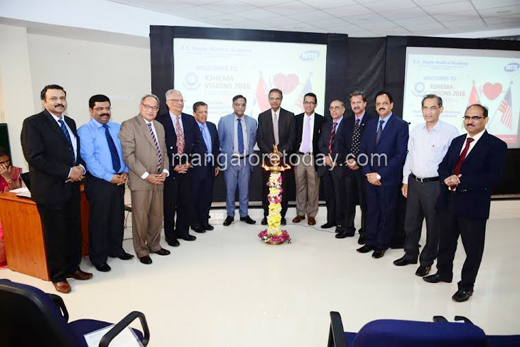 Dr. M.Shantharam Shetty, pro chancellor of Nitte University, Dr. M.S.Moodyttaya, the Registrar of Nitte University, Dr. Satish Kumar Bhandary, the dean of Kshema, Rajendra M, the Financial Director of Nitte University, Dr. Ajith Adyantaya the Senior cardiology consultant, Methodist DeBakey Heart & Vascular Center, Houston, United States, Dr. Paaluru Balakrishnan, Cardiology visiting professor of Kshema, Dr. Bashi, cardio therapist of MIOT Chennai, Dr. Jayaprakash shetty, the Registrar of Kshema were present on the occasion. Dr. S.Ramananda shetty, the Vice chancellor, Kshema welcomed the gathering. Dr. Gopalakrishnan, HOD of cardio vascular Department made the introductory speech. Dr. Lakshmi compiled the program. Cardiology HOD Dr. Subramanyam gave vote of thanks.